What Day Of The Week Is June 14? 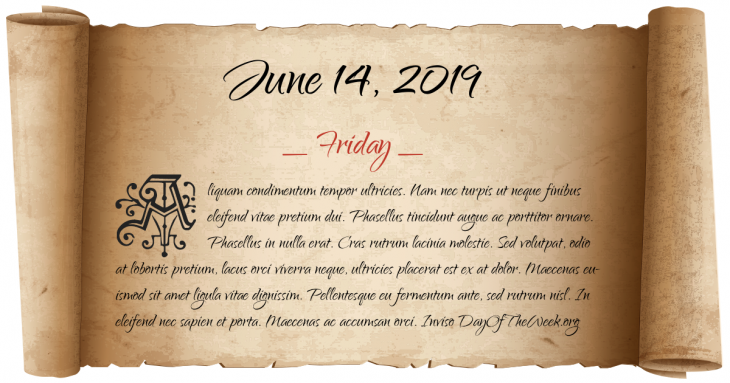 June 14, 2019 is the 165th day of the year 2019 in the Gregorian calendar. There are 200 days remaining until the end of the year. The day of the week is Friday. Margaret Jones is hanged in Boston for witchcraft in the first such execution for the Massachusetts colony. Emperor Napoleon I’s French Grande Armee defeats the Russian Army at the Battle of Friedland in Poland (modern Russian Kaliningrad Oblast) ending the War of the Fourth Coalition. Second Assault on the Confederate works at the Siege of Port Hudson during the American Civil War. John Alcock and Arthur Whitten Brown depart St. John’s, Newfoundland on the first nonstop transatlantic flight. The Falklands War ends: Argentine forces in the capital Stanley unconditionally surrender to British forces. The 1994 Stanley Cup riot occurs after the New York Rangers win the Stanley Cup from Vancouver, causing an estimated C$1.1 million, thus forcing 200 arrests and injuries. One person is also left with permanent brain damage. Who were born on June 14?